Apr 02, 2015 Thank you for your valuable feedback and we take all customers issues very seriously. We are able to look up reservations by the last name of customer, their email address, or telephone number, however, we are unable to locate any reservation with the information given by you to this web site. You can contact me direct at James@BookVip.com. 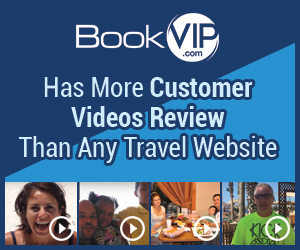 As an owner, I pride myself in BookVip offering the most discounted vacation packages and having an A+ rating Better Business Bureau for our customer service. I didn't like: Customer service and website. Review #567289 is a subjective opinion of User567289. Thank you for your feedback and all deals are booked at BookVip.com. We are the largest travel promotions company and send over 50,000 families on vacations each year. The packages are 60-70% off the discounted price as the resort is subsidizing the cost of the rooms in exchange for 90 minutes of your time. DO NOT BOOK WITH BOOKVIP.COM !! - It is a scam. The reservation must be completed over the phone where they tell you the prices are subject to your acceptance of a high pressure sales pitch for which you must present a credit card and are required to have a minimum income of $60,000. When I asked the representative how would they verify the income, she responded " THE HOTEL HAS ITS WAYS TO FIND OUT" - At that point we backed out completely. The representative became rude and hung up the phone on me. How do they verify income, really? Do they obtain your private information and or credit report without your knowledge??? I HAVE BEEN TO THESE SALES PRESENTATIONS. THEY ARE NEVER 90 MINUTES AND YOU ARE PRESSURED FOR HOURS TO MAKE A PURCHASE. THEY EVEN BECOME ABUSIVE AS PART OF THEIR SALES STRATEGY.